One of the first of 14,000 firework blasts starts the show at the 37th annual Family Fourth of July Celebration in Waveny Park, Tuesday, July 4, 2017, in New Canaan, Conn.
NEW CANAAN — A historic holiday and a tradition of history came together Tuesday evening for the 37th annual Family Fourth of July Celebration in Waveny Park. “It’s a great night,” said Recreation Director Steve Benko, who’s overseen the event since its inception. 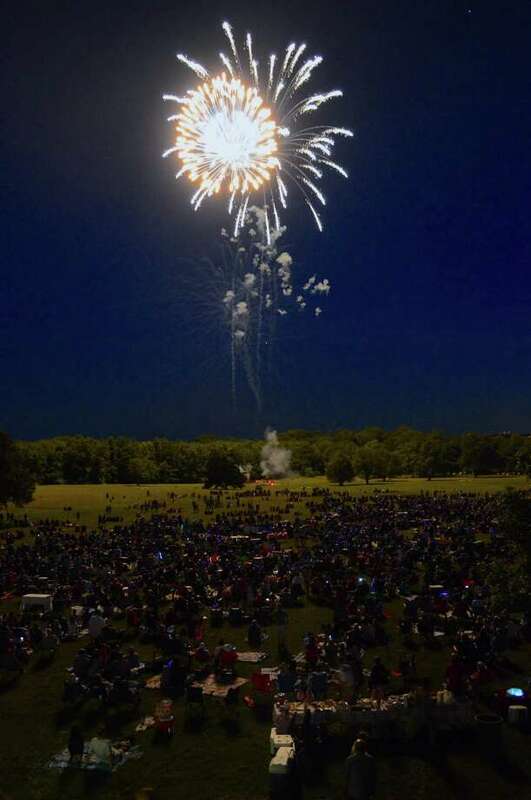 Around 7,500 people filled the great lawn, dining on food, tossing Frisbees, and, after dark, watching more than 14,000 shells explode in vivid colors across the southern sky. Visitors were also entertained by the New Canaan Town Band, the second oldest in the whole country, founded in 1831. “It’s just a fun family event,” Benko said.